The bones of the skull are not joined together firmly at birth. The sutures gradually accumulate minerals and harden (this process is called ossification), firmly joining the skull bones together. In an infant, the spaces where sutures intersect but don't completely touch is called the "soft spot", a membrane covered area also called a fontanelle (fontanel or fonticulus). 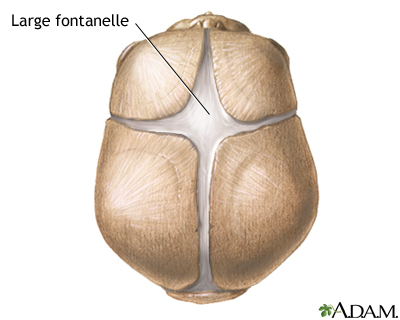 The fontanelles allow for growth of the skull during an infant's first year. When the spaces of the fontanelles are larger than normal underlying causes such as hydrocephalus may be suspected.